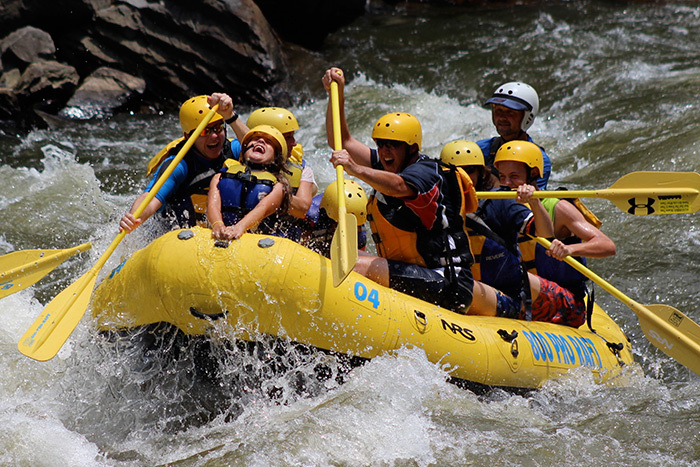 Jump on the raft at Rafting in the Smokies outfitters and make a big splash on your family vacation with your white water rafting in Gatlinburg excursion. You'll encounter big splashes and waves on these exciting white water rafting in Smokies trip on the Upper Pigeon River. Those looking for Smoky Mountain adventures to fill up the itinerary of your Smoky Mountain getaway. Come find out why white water rafting in Gatlinburg is one activity to do on your adventurous vacation with your church group, family reunion, or group of friends today at Rafting in the Smokies outfitters. Rafting in the Smokies offers two white water rafting in the Smokies excursions for the whole group to enjoy. There no need for experience on either trip, and your trained guides will help you enjoy every twist and turn of your wild ride down the rapids of the Smokies. Rafting in the Smokies has provided its white water rafting in Gatlinburg excursions for over 35 years. In fact, they even helped name some of the rapids when the first white water rafting in Smokies outfitters opened in the 70's. Rafting in the Smokies keeps this tradition alive with its Upper Pigeon River rafting excursions. The upper section of the Pigeon River offers riders of all levels (there's no experience required for this trip) 12 Class III and 3 Class IV rapids, making this one of the most unforgettable Smoky Mountain adventures you'll ever experience. There's no need to worry if this is your first time white water rafting - at Rafting in the Smokies, the skilled guides will navigate the group through all the waves and splashes the 5 miles of thrilling rapids your white water rafting in the Smokies tour follows. Expect splashes, bumps, and waves during this 1.5 hour white water rafting in Gatlinburg excursion on the Upper Pigeon River! This trip is open to anyone 8 years old or older or weighing more than 70 lbs. Life jackets/personal flotation devices are provided by Rafting in the Smokies, and it is required for all participants to where these on the raft. Consequently, all riders must be able to fit in a 58″ personal flotation device. Do you have small children in your group or those who are not up for too much of thrill? Rafting in the Smokies offers another white water rafting in Gatlinburg excursion that allows to enjoy a more relaxing ride which boasts Class I and Class II rapids with only one Class III at the end of the trip. You and your group will glide down the lower part of the Pigeon River with your very own white water rafting in the Smokies guide, who will maintain the safety of Float in your boat down 6 miles of this laid back portion of the the river, taking in the breathtaking scenery of the Great Smoky Mountains National Park as you go. Like Rafting in the Smokies' Upper Pigeon River ride, personal flotation devices are provided for your group and it is required to wear them throughout the duration of the trip. This white water rafting in Gatlinburg trip is open to anyone 3 years old or older. For any white water rafting in the Smokies trip, quick-dry synthetic material shorts, t-shirt, or a bathing suit are recommended clothing options, while tennis shoes, deck shoes, or river sandals are suitable footwear choices. Rafting in the Smokies offers its guests a shady picnic area, grills, swimming beach, swing area for small children, and nature trail for their added enjoyment of the outdoors.